I grew up a typical Catholic kid in the Lower East Side of Manhattan. I’m Filipino, but I often kid around saying that I grew up Irish or Italian Catholic; as in those days Filipinos and Latinos haven’t quite taken over the East Side of 14th Street yet, and all the friends I grew up with were one or the other. I grew up in a time, and in a culture, in that part of Manhattan at least, where Vice and Virtue often mixed. You know the story, Dads getting a “get out of jail free card” for a day so they can be at their son’s communion (and many stories of the ilk). Before Mayor Guliani, every September, the stewards of my great city, Mr. Koch and Mr. Dinkins let the businesses of Little Italy and parts of Chinatown, throw the best 11 day family event commemorating a Saint that Italian immigrants brought from across the Atlantic. 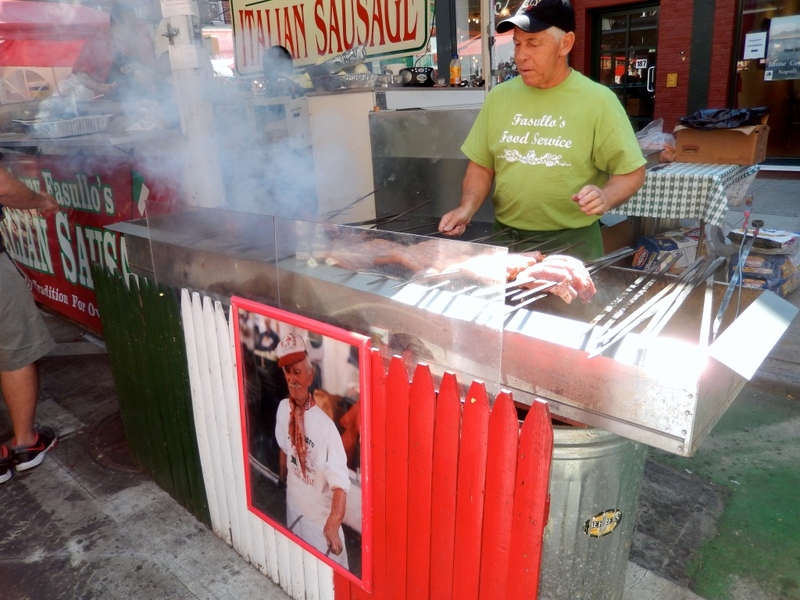 No other event mirrored the reflection of the lower part of Manhattan more than the Feast of San Gennaro. There was gambling in the churches; most businesses were “family”; there was beer drinking on the streets; and kids were out all night. The Feast was celebrated on Mulberry Street stretching from Houston Street to Canal Street and splintering off to the cross streets. It was gigantic. It was street after street of Italian-American food (only). You had your baked clams; your scungilli salad, your zeppole, etc, etc… and of course the grand-daddy of them all, the sausage hero with onions and peppers. 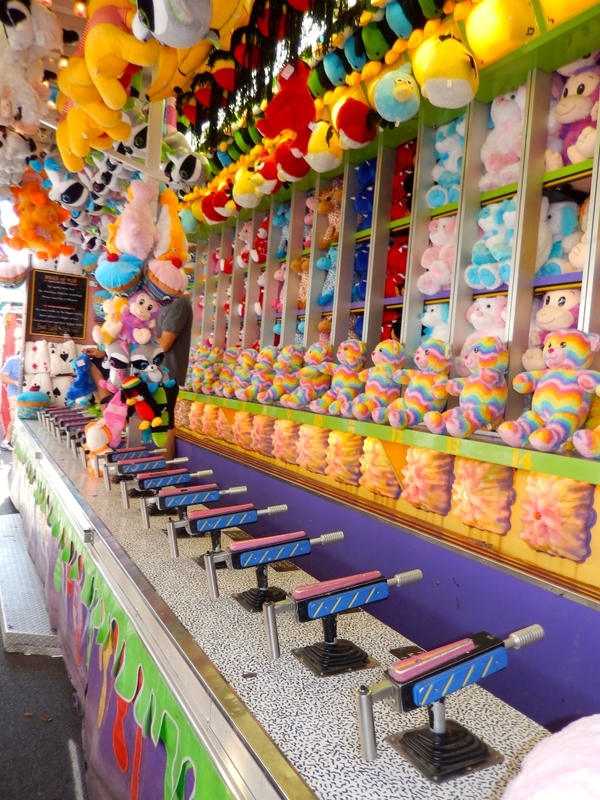 There were carnival games, where all kids, for some reason won some sort of prize. Sinatra was always blasting from everywhere. These were some of the best times I remember spending with my younger brother and my high school buddies. Years ago, we didn’t have Mexican roasted corn at the feast. Years passed and I had moved away for a while and came back in the late 90’s and moved to Little Italy/Chinatown. They call it NoLita now (North of Little Italy) so they can charge me the rent. Be careful when they give your neighborhood an acronym. Every year; my then girlfriend, now wife, Brenda and I had to live through 11 days of the Feast right in front of our door. What was once a yearly occurrence I looked forward to, became the bane of our existence. There were now DJ booths blasting bad Italian pop music, games that were rigged for everyone to lose, non-alcoholic piña coladas! I became a hater. What kid wouldn’t be excited? Then something happened when my daughter Bailey, turned 4 (now 10). I picked her up from Kindergarten class one day and all she could talk about was how great it was that we lived right where the feast was. Then I started to re-live the blessed feast through my daughter’s eyes, as did my wife; and since then we have embraced the good, old saint once again. There’s even Dippin’ Dots now at the Feast. The games and rides ARE a rip off, but what the hell; I’m already spending 9 bucks on a sausage hero and 7 bucks for a Pabt’s Blue Ribbon; lets just enjoy it. I often see tourists enjoying themselves when visiting the feast: taking pictures, biting into sandwiches too big for their mouths, paying too much for a chance to win a goldfish. Rubirosa’s really goes all out for the Feast. 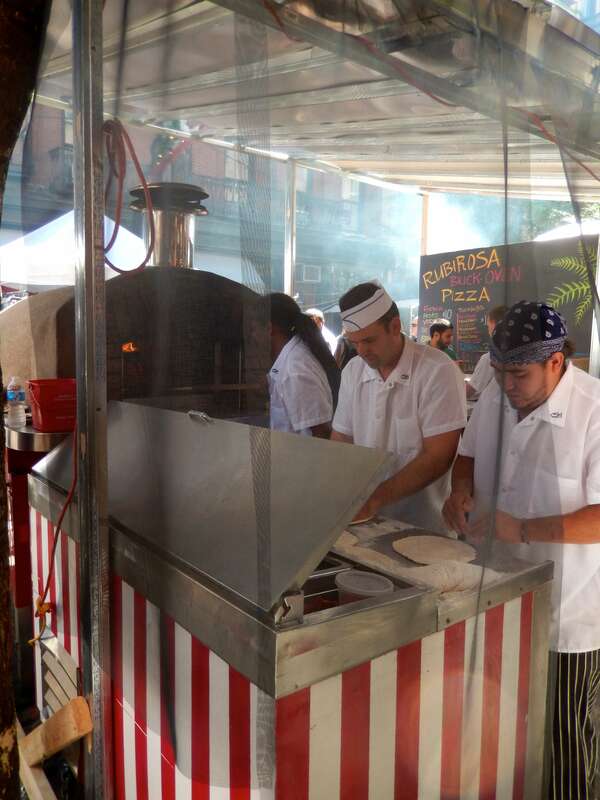 That is a pizza oven they hauled out to the street…YUM! I know that they will tell stories when they get home that’s akin to the ones I tell when I return home from a foreign country. I’ve decided that the Feast is once again great! When this post comes out, it will be the 88th Celebration. By the time the Feast ends, I would have consumed enough sausage, enough zeppoles, drank enough beers (in a contained area) that will probably bring on gout. I would have spent enough money on my child getting on unsafe rides that rival the cost of Disney. There will of course be a minimum of 30 Sinatra impersonators singing how he “wants to be a part of it” (New York New York) which we are lucky enough to be. Supposed to be the best sausage and peppers – there’s always a line at lunch! If you are ever on your way to Positano or Sorrento or any of those Amalfi towns; you’ll go through Naples. At the tip, there is a Church of San Januarius or Gennaro, that carries a relic which has inside the preserved blood of the good old saint. The supposed miracle is that the preserved blood liquefies every 19th of September. It’s that same blood that runs deep in our Lower East Side community. The same community that hosts a celebration every September for everyone from all over to enjoy. Now that’s a miracle! 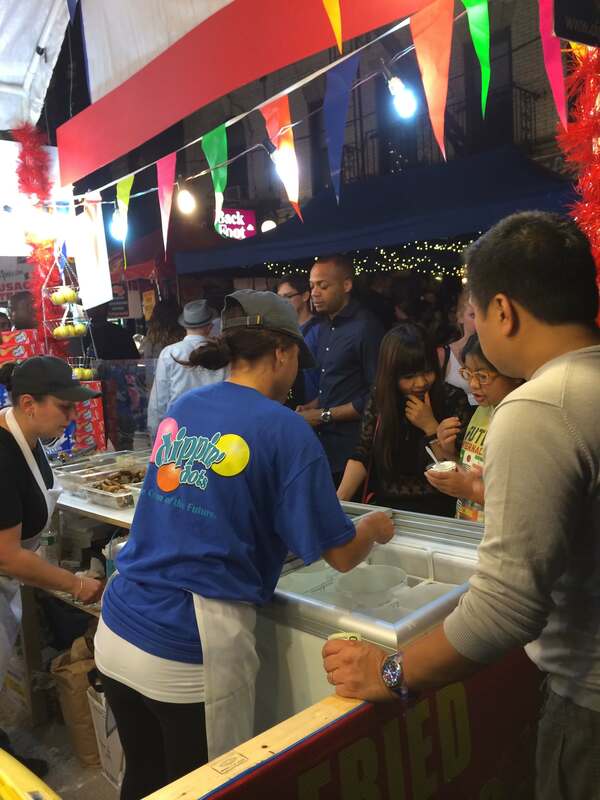 Have you been to the Feast of San Gennaro? Please let us know your thoughts in the comments, we would love to know your experience! Did you like this feast? Then please share it with your friends, we would be so thrilled! Let’s travel the world, one dish at a time! i haven’t (yet) been to the feast of san gennaro in nyc. but i imagine i would love it, having grown up next door to italian grandparents! i love how you were able to, once again, view and embrace the feast through the eyes of a child. April, I’m sure you would’ve enjoyed it. Our daughter definitely makes it so much fun for us. Thank you for coming along with us to the Feast. 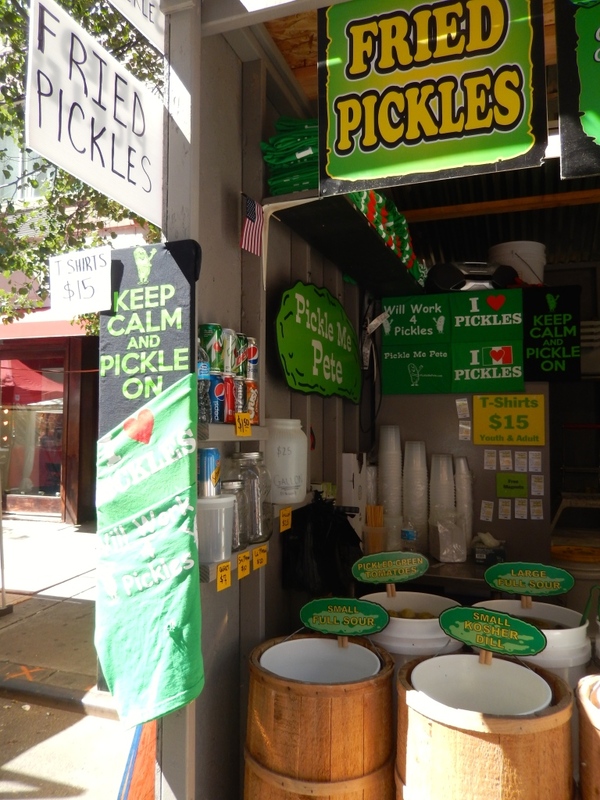 I love that this blog is expanding my travel list of things to do/experience/see/eat. Love the personal stories you and Brenda share. I haven’t been to the feast of San Gennaro but I’m excited about checking it out! Puja: Thank you for your kind words. I know it’s hard to get to New York in September during the feast. So for starters, grill up some Italian Sausages, and put on some Sinatra. Hahah I’m on it! And I was in NYC last year during September but didn’t know about the feast. This year’s trip will be in November. Any recommendations? Nichole, that Mexican corn was one of the best dishes at the feast..haha! I will let Andrew know your thoughts! thank you for coming along!